While property/casualty rates continue to decline they are doing so at a slower pace, according to two market surveys. There were signs that the market may be flattening and modestly easing upward in some areas, according to The Council of Insurance Agents & Brokers First Quarter Commercial P/C Market Index Survey. Meanwhile, online insurance exchange MarketScout reported that moderating trends continue into the second quarter, with the composite rate for U.S. P/C insurance down four percent in April 2011, unchanged from March. General liability and umbrella coverages priced most aggressively among coverage classifications at minus 4 percent. When including the large volume of non-catastrophic driven business property rates were down 3 percent, according to MarketScout. Note: catastrophe-exposed properties assessed a slight rate increase of 1 percent to 4 percent. WorkersÃ¢â‚¬â„¢ compensation, professional liability, directors and officers (D&O), employment practices liability insurance (EPLI) and fiduciary coverages were all flat. Check out Insurance Information Institute (I.I.I.) information on industry results and financial conditions. 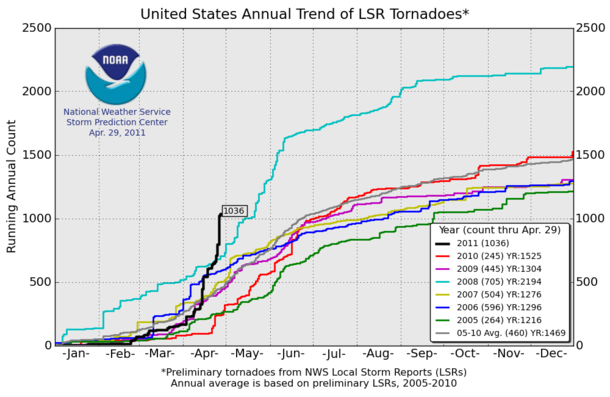 Latest data from the National Oceanic and Atmospheric Administration (NOAA) indicate that there may have been 871 tornadoes in April 2011, bringing the total for the year so far to 1,036 (see NOAA chart below). But before we jump to conclusions about record-breaking numbers, itÃ¢â‚¬â„¢s important to read the fine print. First, these figures from NOAAÃ¢â‚¬â„¢s Storm Prediction Center are a preliminary count of eyewitness reports for tornado events not a count of actual tornadoes. SPCÃ‚ also cautions that comparisons between preliminary counts and actual counts from prior years should be avoided. An articleÃ‚ by the Dallas Weather Examiner points out that if all the 871 tornado reports during April 2011 verify for separate tornadoes, then this would eclipse the current monthly record of 542 tornadoes from May 2003. But it goes on to suggest that because many of these reports are duplicates, the verified tornado total for April 2011 will probably come in below 542. This would leave May 2003 with the highest tornado count for any month. Check out the Insurance Information Institute (I.I.I.) Disaster Newsroom for latest tornado updates and eyewitness reports from Tuscaloosa, AL by Bill Davis, regional representative for the I.I.I. Check out I.I.I. facts and stats on tornadoes. This excerpt from a memo to employees by Leon Panetta, director of the Central Intelligence Agency (CIA), underscores the point that while the killing of Osama Bin Laden is a positive development in the war on terrorism, the threat continues to evolve. Insurers, among other industries, must remain alert to the possibility of reprisal attacks. A recently updated Insurance Information Institute (I.I.I.) paper explains why terrorism risk remains extremely problematic from the insurance standpoint. It also discusses the importance of the terrorism risk insurance program Ã¢â‚¬“ a public-private risk sharing partnership that since 2002 has allowed the federal government and the insurance industry to share losses in the event of a major terrorist attack. To learn more about the insurance implications of Bin LadenÃ¢â‚¬â„¢s death, check out the video below featuring I.I.I. president Dr. Robert Hartwig speaking from Ground Zero. An articleÃ‚ by PC360.com has further insurance market reaction to Bin LadenÃ¢â‚¬â„¢s death.